View More In Rain Barrels & Accessories. California prop 65 warning: This product contains chemicals, including lead, known to the State of California to cause cancer and birth defects or other reproductive harm. Wash hands after use. Low Lead, Contain Less than 0.25% Lead by Weight. Lead Free Compliant. OK for potable water. Need 1-1/4 inch diameter hole to install. Fit up to 10mm thickness wall. Right Handed Bulkhead Fitting Nut, Designed for easy un-installation. Do not apply any grease on the gasket. 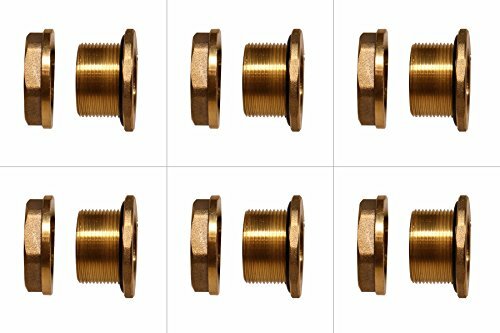 For reverse threaded version, please see F075LFLH in our amazon store. If you have any questions about this product by RAINPAL, contact us by completing and submitting the form below. If you are looking for a specif part number, please include it with your message.